The rising tide of discontent-the unveiling of who we are. There is a growing discontent with the status quo. The establishment of the Republican party is no difference than the establishment of the Democrat party. In Britain the established political parties were abandoned in favor of rebellion. I do not believe the establishment will stand idly by and allow their power to simply slip away wither in Britain or in America. Jesus had to die so that the establishment in Israel could maintain the status quo so in the end Pharisees and Sadducees and Herodians ( the political class) came together to get rid of the one man who could truly rock their society. They supposedly hated each other but found common cause in protecting themselves. That is what all establishment does, whether it is religious or political. God says that judgment begins at the house of the Lord. We have seen that already and it is ongoing, now we see the structures of Western society begin to unravel. And the scary thing should be for the world, once it begins it can really only have one end. The western world will ultimately choke on what they call freedom. The civilized always reverts to the barbarian because everything they do lies within the realms of their own human nature which is ultimately corrupt. Only a reborn spiritual man stands against the lusts of men and that stand typically is awash with blood. The blood of the saints will be spilled and it will be spilled by a world in total rebellion against God. One could well argue that the blood of the saints is being spilled on a grand scale right now in various parts of the world. That is correct. Yet we can dismiss this in our minds as the actions of barbarians whether in parts of Africa, the Middle East, China, North Korea and so on. Yet all men are barbarians. No where was this more clearly revealed than in the two world wars of the 20th century where men died on a biblical scale. In fact the slaughter of those two wars make any previous barbarians look positively civilized. Yet let me encourage the saints. When men are at their worse, Gods children are at their best. What brings out the worse in men brings out the best in the children of God. As gross darkness rises in the land then the bearers of the light stand out. We are the bearers of the light. By virtue of that we shall stand out and be separated from the rest of the world. When we are separated from the world, truly separated from the world, our true identity is established in the eyes of men. When the eyes of men are turned on the children of God with wickedness in their hearts then God begins to raise up a standard in His children. He will not allow this flood of evil to drown us, He will raise us up to higher ground. He will draw us deeper into His heart. He will be with us as we pass through these turbulent waters and the waters shall not overcome us. He will be with us as we walk through the fires and the fires shall not consume us, no, quite the opposite, it will merely burn away the chaff, the flesh that lies within us and make us to shine greater than we have ever shone before. We will be a witness and then the end shall come. 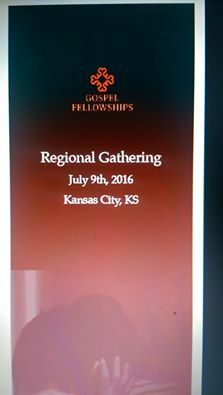 Gospel fellowships, which is a branch of sermonindex.net is having a gathering on July 9th ( a Saturday) here in Olathe, KS. It is one of twelve regional gatherings. I will be moderating. The reason for the gathering is to discuss the times in which we live and what lies ahead for the saints in an increasingly anti-Christian society. Making connections with saints of different backgrounds but similar mindsets. Now, I don’t mean come and listen to a couple of guys, I mean come and share what the Holy Spirit has been showing you. The meeting is from 10am to 3pm breaking for lunch. The afternoon session will be a time for corporate prayer. It will be held in the Olathe Healing rooms ( where I will share next Friday evening) You can e-mail me Frank McEleny, for details at appolus@aol.com. The details will include the schedule for the day and local hotel if needed. The capacity of my soul, the power of my life. Brothers and sisters can we say what brother Meister is saying? You see when he said it? Somewhere back in the late 1200s. No matter when in the last 2000 years, the presence of God has always been of the utmost importance to the saints. He is saying that his very existence depends upon the nearness and the presence of God. Now he is not talking about his physical existence, although we know that God holds everything that exists in the palm of His hand and without Him nothing would exist or survive for He is the very fabric of the universe, He spoke it into existence and it exists and is sustained solely because of Him. No, he is talking about his existence as a child of God. Our capacity to walk through this world as a spiritual child of God depends entirely upon the nearness and the manifest presence of the living God flowing through our lives every moment of every day. Outside of this awareness, outside of His nearness to us then we are simply like other men walking through this world. If we are to walk through this world in the Kingdom of God we must know and understand and be taken by the presence of God. We must see God in our lives on a daily basis. He must be with us as we walk out the door in the morning, He must be with us on our way to work and as we interact with people on the way to work. He must be with us throughout the day. He must be with us in the midst of our family and friends and our circles of influence. He must be our first thought when we awake in the morning and our last thought as we lay our heads down upon our pillows. There is, without a doubt, a spirit of intimidation that stalks the land. It has all but silenced Christians of every stripe. It is a bold swaggering spirit not unlike Goliath as he poured scorn on God’s people. There has to be the Spirit in us that was the same Spirit in a young shepherd boy. We must not be silenced. And I am not talking about any one sin, I am talking about the fundamentals of our faith. This is a fact, there is only one way to heaven and that is through Jesus. The swaggering spirit is trying to shut that truth down. People do go to hell if they reject Jesus. This has been all but shut down and is just a step away from being considered hate speech. The answer in this dark day is the same answer. We need to be baptized in the Holy Spirit that enables us to be bold and unashamed of the Gospel of Jesus Christ for it is the power of God unto salvation. Can we see the connection between un-ashamedness and power? One goes along with the other and of course the reverse is true. There will be no power of the Holy Spirit in your speech if you are ashamed of the Gospel or the name of Jesus. If we are ashamed of the name of Jesus before this wicked and adulteress generation then the Lord will be ashamed of us before His Father in heaven. This should cause us to tremble. The way of the cross is supernatural and the fruit of this is the joy and peace that is exhibited by those who travel along the deepest valleys and in the shadow of death. The world understands peace and joy when circumstances are correct and pleasant, the world does not understand joy in the midst of trial. The closest the world has come to is stoicism and I have witnessed much stoicism in Christendom, but stoicism is not joy and peace. Stoicism is the endurance of pain or hardship without a display of feelings and without complaint. The English might call it the stiff upper lip. Yet the way of the cross is entirely different. It elevates the spirit above the storm. It produces peace and joy and even epiphany. Think of Stephen as he was stoned as an extreme example of moving in the supernatural. He had his vision and cried out that those who stoned him would not be held guilty for their crimes. The lowliest saint who walks the way of the cross is more noble than any nobleman that has graced the pages of our history books. The saint who walks in the way of the cross walks in the shadow of the Almighty and casts the shadow of the almighty on the earth because the Lord Himself dwells within them. This is our calling saints, it always has been. This calling has to be understood in the depths of the saints soul and when it is then that saint is prepared for their own bloody Via Dolorosa. The Body of Christ is soon to walk this path corporately. What a glorious triumph of the Spirit this will be. Evil shall be overcome by the Blood of the Lamb and the Word of our testimonies and the world will witness that the Body of Christ loved not their own lives unto death. Every person is a vast unexplored universe. Only Jesus has the ability to navigate the human heart and map it. Without the navigator, without the map all is chaos and darkness. Without the ship of God and Jesus the Captain, you will only ever stare at the horizon of your souls and be fearful of what lies beyond. People are vastly complicated, God much more so. The door to the deeper walk with Jesus is the unexplained. When you come to the end of yourself, when your dogma fails you, when you cannot explain or understand your situation, then you are at the door. And the password? “Yet though He slay me, even then I will trust Him.” If you want to go deeper with God, allow Him to search you. Join Him in the journey that goes beyond what you understand, into the deeper waters, and beyond the horizons of your understanding. Every trial that you face, every difficult situation that arises is an opportunity to explore the depths of God and who you truly are in Him. Situations can either draw you deeper into the Father’s heart or they can cause you to bury your treasures in the sand. God has poured into His children wonderful treasures from the storehouses of heaven. What will you do with such treasures? Will you give to others the treasure of your love? What about the riches of your forgiveness? So brothers and sisters will you explore the vastness of God today? Typically the vehicle used to go on this kind of journey is the vehicle of difficult situations. I am not sure what your difficult situation is today but I know that it presents to you an opportunity to praise Him in the midst of it which unleashes great power. God inhabits the praises of His people and no-where is the manifest presence of God so felt, so experienced than in the midst of great trials. Truly you can have the greatest mountaintop experience with God in the very depths of the lowest valley.